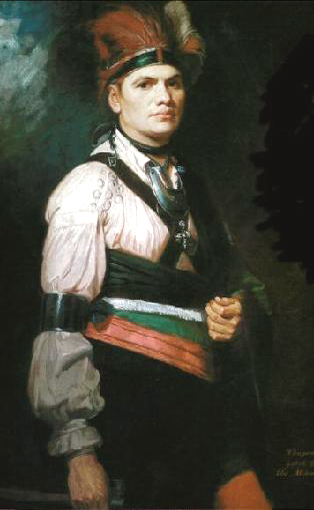 Joseph Brant, also known as Thayendanegea, was a Six Nations Mohawk Chief. During the American Revolutionary War (1775-1783) and after, Brant faithfully supported the British under the rule of King George III(1). As the political upheaval of the thirteen American colonies intensified, Brant persisted and eventually, in 1777, persuaded his people to break their treaty of neutrality with America and align with the British. Consequently, he relocated his people from the Mohawk Valley – in present-day New York – to Carleton Island, named after Sir Guy Carleton, British commander in resisting the American Revolution(2). Carleton Island and Fort Haldimand (named after Sir Frederick Haldimand, Governor of Canada from 1778-1784), served as headquarters for Joseph Brant and his people, as well as Loyalists, to authorize and conduct raids against Americans in the war. The Treaty of Paris, signed in 1783, ended the American Revolutionary War between Great Britain and America and its allies. The treaty recognized Carleton Island as American territory; it was one of the many boundary settlement locations generously allocated to America by the British. In the land provisions of the treaty, however, there was no mention of Aboriginal Peoples or their ownership of land. 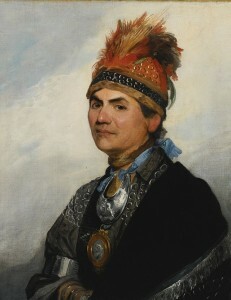 Joseph Brant and the Mohawks were upset with the apparent disregard for their needs, as well as having to relocate yet again; this prompted Brant to seek aide from Sir Frederick Haldimand. In exchange for their unwavering loyalty to the British, Haldimand committed to finding suitable land on which they could settle. Brant claimed that the land around Fort Frontenac was rightfully theirs, as they used it as seasonal hunting grounds(3) – though at the time, the Mississauga were the official owners. The Crawford Purchase of 1783, named after Captain William Crawford, resulted in the Mississauga selling the land to the British Government, where it was subsequently offered to Brant and his nation. After settling in Cataraqui, Joseph Brant continued his efforts to successfully lead his nation to a peaceful and prosperous life. He often mediated issues that arose between the Mohawks and various other bands, as well as encouraged assimilation to and acceptance of the European culture that encompassed them. In 1780 (after being widowed by his first two wives) Joseph would marry Catherine Croghan and have seven children with her. Catherine, unlike Joseph’s sister, Molly, assumed similar beliefs and ideas regarding assimilation to another culture. The family settled into a predominantly European way of life, though stayed in touch with their Native heritage as well.